You can learn to draw. It's like learning to ride a bike, write a sentence, or play a video game . You don't need any 'talent', you just need an interest. This Course is about YOU. Look, we've all been sold the 'lie' that you have to be talented to become great. It's cost us our power, our belief in ourselves, and now we need to do away with that lie. 'Talented' is what we call people who've put the time in. The few who've practiced the simple, fundamental concepts that most people gloss over. In fact, we're typically inclined see and talk about the results...but seldom do we take note of the JOURNEY. That's what the beginner drawing course is for, to get you kick-started on your own journey toward greatness. The Beginner Drawing Course makes it easy to understand the basic concepts of drawing, so you can immediately begin to apply them and see great results. It's a simple and intuitive process that will take shape once you begin to apply the basics. 1. Intro to Drawing - The right state of mind, body, and attitude. 5. Values and Forms: - Values are second only to drawing in importance. 6. Easy and effective perspective - Create an instant feeling of space. 7. Creative drawing - Using Reference as a path to success. You might be wondering how you're going to really get the most from this course without having to spend 8 hours a day drawing and practicing. You might not even believe you can be an amazing artist. In fact, I felt the same way when I started! And up until recently, there seemed to be a brutal learning curve to drawing. But then I discovered there was a better way to go about it. I chanced upon a whole new mind set that made learning to draw seem so much more straight-forward. In fact, once I changed my approach, I had no more frustration, no more confusion. It was like I had discovered some sort of secret. 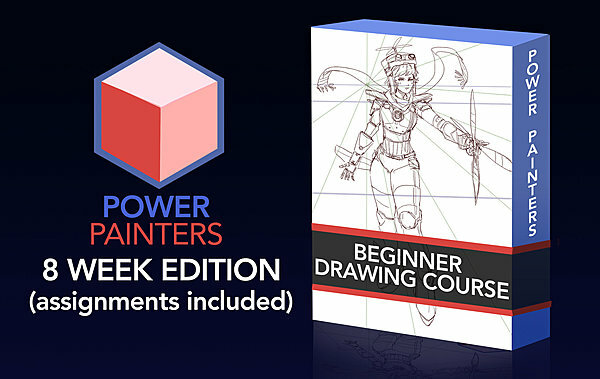 The real secret to this course is that it doesn't just teach you how to draw. It teaches you how to learn, how to overcome all obstacles, and how to defeat negative thoughts and beliefs to realize your potential sooner. So if you'd like to draw better, faster, and see your art improve drastically enroll in the beginner drawing course today. Taylor Payton is a pragmatic polymath. Ever since he was a child, he's felt the need to constantly expand his prowess in the creative domains, while learning, teaching, and sharing as much as he can with the world. In 2013 he Graduated from the Art Institute's International Minnesota with a Degree in Media Arts and Animation. And he's since gone on to work in film, games, TV, and amass a following of Artists via his Power Painters YouTube channel. Today, Taylor's interests lie in moving toward mastery of drawing, painting, and working on his ever-growing musicianship.